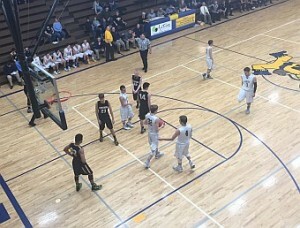 The Negaunee Miners won 56-44 over the Norway-Vulcan Knights on Sunny.FM. Negaunee, Michigan February 5th, 2016 – The Negaunee Miners Girls Basketball team hosted the Norway-Vulcan Knights tonight. Jesse Anderson and Brady Guilbault were there LIVE from the U.P. Propane Broadcast Booth on Sunny.FM. The Norway-Vulcan Knights won the tip, scored, and took the early lead. The Negaunee Miners answered back immediately to tie the score 2-2. Hailey Fezatt scored the next basket for the Miners and give them the lead 4-2. The Negaunee Miners went on an offensive spree after that and led 11-2 at the halfway mark of the quarter. The Negaunee Miners maintained the lead to end the quarter 19-9 against the Knights. The Noway-Vulcan Knights started the second quarter with the first basket, but the Miners took over in the next 2 minutes to lead 26-11. The Negaunee Miners played impressive offense and led 28-15 with 4 minutes left in the first half. The Negaunee Miners maintained a 37-20 lead over the Norway-Vulcan Knights to end the second quarter. The Miners and the Knight started the third quarter swapping buckets to make the score 39-22 in favor of the Miners. The Norway-Vulcan Knights started to cut into the Miners lead in the next few minutes to trail 41-29 halfway through the quarter. 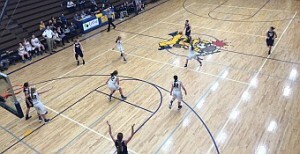 The Negaunee Miners ended the third quarter leading 43-32 over the Norway-Vulcan Knights on Sunny.FM. The Norway-Vulcan Knights continued to cut into the Negaunee Miners lead in the opening seconds of the fourth quarter, to trail 43-34. The Miners were on a scoring drought until halfway through the quarter when Aleda Johnson scored a three pointer, to give the Miners a 46-34 lead. The Norway-Vulcan Knights put on the pressure in the end of the fourth quarter, but the Negaunee Miners pulled out the win 56-44. 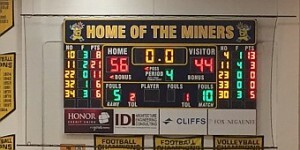 The Negaunee Miners defeated the Norway-Vulcan Knights (56-44) on Sunny.FM. The Negaunee Miners Girls Basketball team will travel to Calumet, Michigan February 9th, 2016 to face the State Champion Calumet Cooper Kings. Join Jesse Anderson and Brady Guilbault for all the exciting action from the court. The Honor Credit Union Pre-game Show will start around 7:00pm and the game will follow at 7:30pm on Sunny.FM.